The early history of the town of Sheboygan Falls begins with the village of that name, for the reason that the first settlement here was made at the locality now the site of the village. The land in this region had been surveyed and brought into market in 1834 and 1835, and Colonel Silas Stedman, with others, having purchased the land where the village of Sheboygan Falls now stands, the purchase price being $13.50 per acre, in partnership with Randall B. Marcy, platted the village in the latter year and gave to it the name of Rochester. Their first enterprise in the way of building was an exceedingly crude grist mill. This was soon followed by a sawmill. In 1837 David Giddings arrived and bought Mr. Marcy 's half interest. Soon after this the first frame house in the settlement was built on the hill above the lower falls, which was later occupied by Colonel Stedman and finally came into the possession of John E. Thomas. When the village was first platted a tract of land for a public square was laid out, bounded by Broadway, Maple, Buffalo and Pine streets. For some season this pleasure spot was omitted in a subsequent survey made by David Giddings in 1846, very much to the loss of the citizens, and to this day Sheboygan Falls is destitute of anything resembling a park. Among the earliest settlers here were H. S. Wright, John McNish, Jonathan Leighton, A. K. Littlefield, Darius Leavens, Silas Jackson, Almond Andrews, William Trowbridge and family, who came in 1836, David Giddings, Charles D. Cole and family, who removed from Sheboygan in 1838. Samuel Rounseville came to the Falls in 1842. He had been preceded by Albert Rounseville. Harvey Giddings, a son of David Giddings, was bom in the village in 1843. Nathan Cole, a son of Charles D. Cole, was born in the village in 1842. August Ebenreiter came here in 1842, and Harmon Pierce in 1844. During the years 1845 and 1846 William WhiflFen, Newton Goodell, G. W. Peck, Nathan Sargent, Joseph Richardson, J. H. Denison, R. Schlichting, August Kalmerton, William Galaway, George O. Trowbridge, E. S. Thorpe, Seth Morse and William Davis threw in their lot with the pioneers of this settlement. Of these only the Pecks, Richardsons, Denisons, Galaways, and Schlichtings are still represented in the community. William Prange, Sr., a native of Germany, settled in Sheboygan Falls in 1848. John E. Thomas, a native of New York, settled in the village of Sheboygan Falls in the fall of 1849, where he engaged in merchandising. The year 1858 found him practicing law and later he became president of the Dairyman's Bank. For some time he was editor and proprietor of the Sheboygan County News. He served on the county board and for six years was a member of the state board of regents of normal schools. He was also county superintendent of schools. Mr. Thomas served his constituents in the Wisconsin assembly and also in the state senate. These early settlers of the village were mostly of New England extraction but many of them had removed from their native state into the interior of New York generations before coming to Wisconsin. David Giddings was a second cousin of Joshua Giddings, of Ohio, of abolition fame, and the Trowbridges belonged to a famous family of Massachusetts of that name, of which J. T. Trowbridge, writer of boys' stories, became most prominent. The Denisons had ancestors in. the Mayflower and the Coles were of Revolutionary stock. Some of those who first settled at Sheboygan Falls eventually left the village and went on farms in the town. In the early fall of 1837 Deacon William Trowbridge moved from Sheboygan and opened up a farm two miles west of the Falls. This was the first settlement outside of the village and the Deacon lived so close to the village that he was credited as being one of its earliest settlers. In 1843 and 1844 a large number of people took up lands in the town about the Falls, several Germans coming and settling on the Green Bay road about three miles north of the Falls on sections 13 and 14. Among them were E. Logeman, N. Heide and Levi Hubbard. Others who took up land at this period were William Whiffen, Newton Goodell, G. W. Peck, James Little, Nathan Sargent, William W. Robinson, John Atwood, Joseph Richardson, W. Mayberry, Robert Wood, John Keller, J. H. Denison, E. L. Sargent, Peter and George Mantz, R. Schlichting, Ferdinand Deiurs and John Kaestner. On the 1st of June, 1844, Dorothy Trowbridge, wife of Deacon Trowbridge, sickened and died. This was the first death of white woman in the county, and the remains of Mrs. Trowbridge were the first to be buried at the Falls. In 1842 a grist mill was built to take the place of the primitive one, said to be built by Colonel Stedman, and the mill stones made of granite rocks, brought here from Milwaukee and dressed by a Mr. Palmer were taken from the first mill and placed in the new one. Bolting cloth was made of book linen, and after the mill was ready for service some years elapsed before there was sufficient grain raised in the county to keep one set of stone running a fourth of the time. Dr. Coela, physician and lawyer, settled at the Falls in 1844. He afterwards founded a settlement north of Sheboygan whose people were known as Fourierites. The doctor-lawyer was one of Fourier's great disciples in this section but his colony of the new philosophy lasted but a short time. This same year came A. T. Littlefield and Jonathan Leighton, who built a sawmill on the west side of the river. A number of settlers arrived and located outside of the village in 1845. Among them were George Howard, who secured land on section 17, where he built a sawmill. William Whiffen first located on section 20, and afterwards on section 22. Then there were Newton Goodell and W. Peck, lUinoisans, who began to clear farms on section 29. Henry Williams located on section 29, and James Little on section 30. Nathan Sargent settled on section 26. Others who came in 1845 were August Kalmerton and William Galaway. The high tide of immigration set in in 1847, 1848 and 1849, the new settlers being composed mostly of Germans, who took up a great part of the remaining government land in the town and by perseverance and industry made farms out of the unbroken wilderness that were unsurpassed by any in the county. Among them may be mentioned John Schroeder, Johannes and Henry Burkhardt and Alba C. Peacock. 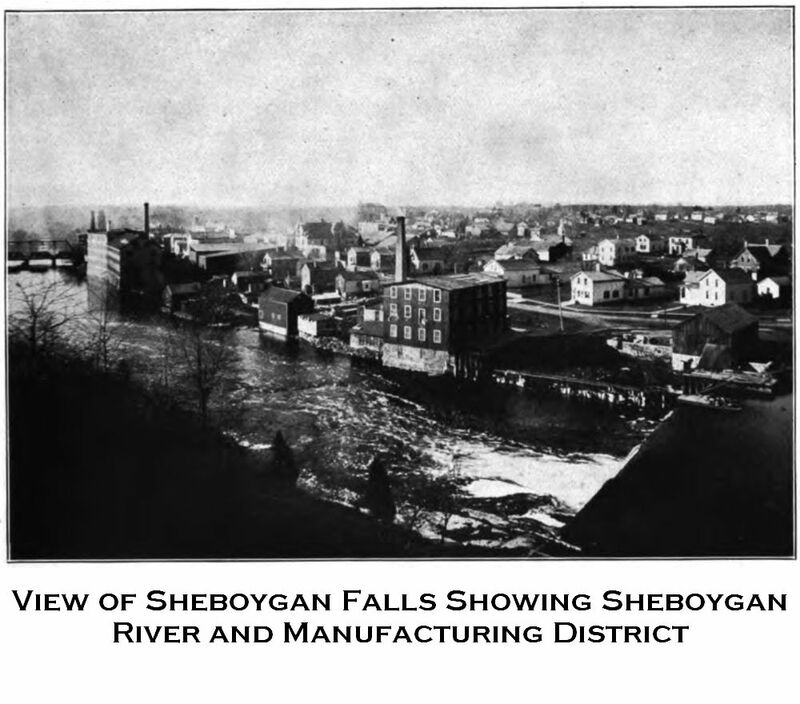 No record can be found showing the date of the organization of the town of Sheboygan Falls but it is presumed it was the first town separated from the town of Sheboygan, which at the time included all of the territory within the confines of the county. The town is bounded as follows: on the north by Herman, east by Sheboygan, south by "Lima and west by Plymouth. The land is well watered by the Sheboygan river, which takes its sinuous way from the northeast comer of tl^e 'town diagonally across the center south through the village at the southeast corner, and thence on until it reaches Lake Michigan. The Pigeon river cuts across the northeast corner of section i, and the Mullet river enters the town at section 31, and taking a rather irregular course, leaves the town at section 34 and empties into the Sheboygan river at section 35. The soil is very fertile and will produce in abundance almost any kind of a crop indigenous to this latitude. The raising of cattle, hogs and sheep and the making of cheese are the principal industries. As has been before stated, the name originally given to the village was Rochester, but was rarely used, for in the early days settlers would refer to the place as the "Falls" to designate it from Sheboygan, which was referred to as the "Mouth." To obviate all difficulties the United States postal department officially changed the name to Sheboygan Falls and the legislature confirmed the change by statute the same year. 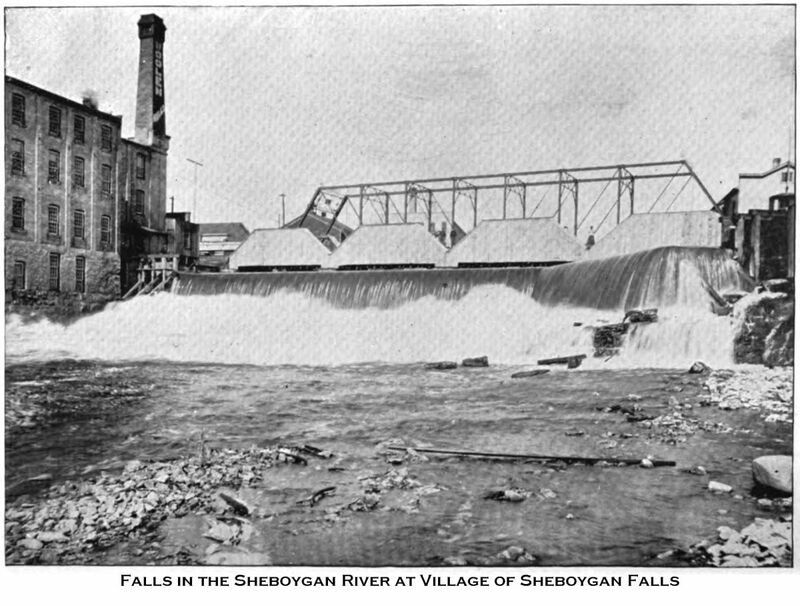 Sheboygan Falls as a distinct entity dates from May 1, 1854, its separation from the town taking place that year. The first election of the newly created village was held May 1 and the number of votes cast was 47. John Keller was chosen president; George Trombull, A. Skinner, J. E. Thomas, and W. D. Kirkland, trustees; H. S. Marsh, treasurer; William H. Cole, clerk; William C. Eastwood, marshal. The first postmaster in the village was George B. Babcock, who received his appointment September 22, 1837. On November 20, 1839, the post office at Sheboygan had been discontinued owing to the desertion of its inhabitants and from that time until October 25, 1844, the only postoffice in the county was at this place. The first marriage here was that of Samuel Ashby; the first person to die was Mrs. William Trowbridge, and hers was the first burial in the town. The first German settlement in the county was made in the town of Sheboygan Falls in 1845. The first church to be established in the county and in the state was the Baptist. This church was organized at Sheboygan, February 11, 1838. The Freeman was the initial newspaper at the Falls. It was started in 1851 by J. A. Smith and remained in the village a year or two, when it was moved to Fond du Lac. Here were established the first and only woolen mills in Sheboygan county, and in 1846 Horace Trowbridge put up the first foundry in the village. It was for some years the only one in all the region between Milwaukee and Green Bay. In 1850 a foundry was erected for the manufacture of plows and water wheels, and in 1859 the manufacture of rakes was begun by E. Quinlan. William Servis was manufacturing carriages and wagons here as early as 1854, and in 1869 H. Schumann was engaged in the same business. The Hill & Clark hub and spoke factory was in operation early in the village's history but was destroyed by fire in 1865. Joseph Osthelder was running a brewery here in the '60s, and about that time Henry Dickers brewery was in existence. Numerous fires of destructive character occurred from 1865 to 1880. 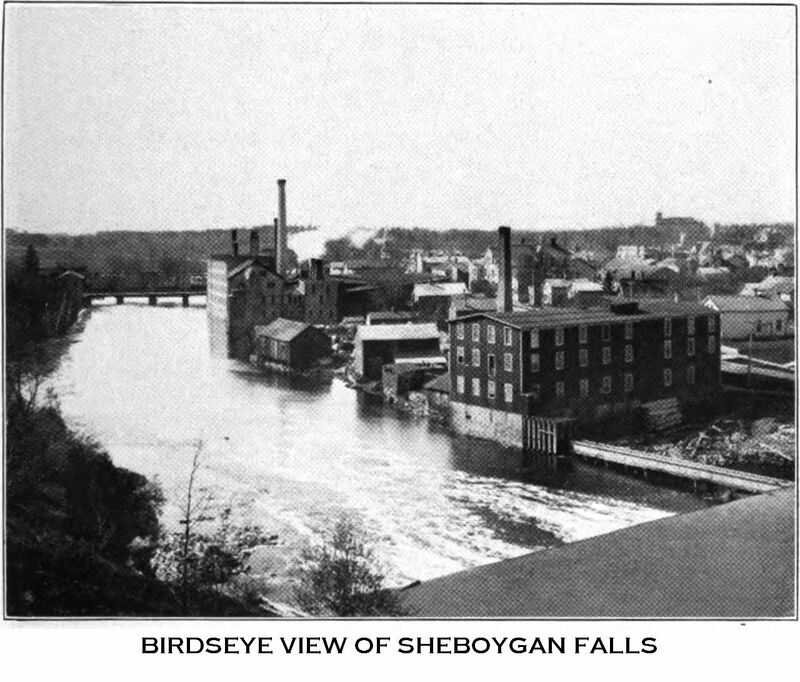 In 1887 a branch office of the German Bank of Sheboygan was opened at the Falls. In 1867 a hook and ladder company was organized and in 1869 a hand engine was purchased. As is always the case in the building up of a new community, the thoughts of the pioneer are not fixed entirely upon the present but reach out and center upon the preparations for a future existence. Outside of the strenuous activities of the day come other things of a higher nature. The settlers gather in each other's cabins for religious services and as they grow in strength and numbers it is not long before a society is organized of some religious sect and soon a building is erected for church purposes. The Baptist congregation was the first one organized at the Falls and this was preceded by services held in the cabins by Deacon William Trowbridge. He was the first minister of the gospel in this part of Sheboygan county and made many tedious trips on foot and horseback to render the last services for the dead of his departed neighbors. He was one of the prime movers in the organization of the Baptists in 1838. Assisted with him in this endeavor were Deacon A. G. Dye, his wife, Dorothea Trowbridge, William S. Trowbridge and Sarah Cole. The organization was effected, however, while these charter members lived in Sheboygan but when they removed to Sheboygan Falls the church went with them. It is said this was the first Baptist church organized in Wisconsin. For a time Deacon Trowbridge was its chief mainstay. Elder Hitchcock was its first pastor, and Elder Lull its second. For his services the last mentioned pastor received $75 the first year. The Methodist church was organized in 1846 and the Congregational in 1849. An Episcopal church was organized some time in the early '60s and the building was erected in 1869. The people of St. Peter's Episcopal church held their first services in Free Hall. Dutch Reform and Catholic churches came later. The industrial activities of the village began of course with the first mills. In 1858 a lath mill was attached to the Richardson sawmill, and later a planing mill became a part of the concern, which eventually developed into a chair and cheese box factory. In 1855 J- D- Czould established a tannery, which came into possession of Charles Weisse, Sr., in 1866. In 1861 William Prentice built the first woolen mills. The village in deportment is par excellence, so that but a small police force is necessary. The streets are well lighted by electricity and while there are no paved streets, the thoroughfares are kept in good condition. Sidewalks are mostly of cement. The Fond du Lac branch of the Chicago & Northwestern railroad cuts through the village and, with the interurban, the citizens have easy egress to the outside world. The first person to be appointed, postmaster at this point was George D. Babcock, whose commission was dated September 25, 1837. His successor was Charles D. Cole who took up the duties of the office January 11, 1840. When the post office was discontinued at Sheboygan in 1839, the only post office in the county from that time until 1844 was at Sheboygan Falls. In the year last mentioned the office at Sheboygan was reestablished. The incumbents of this office following Charles D. Cole were: Alexander C. Mulliner, September 19, 1845; Samuel Foster, June 3, 1847; Jedediah Brown, July 12, 1847; Truman Parker, January 27, 1849; William H. Prentice, May 1, 1849; John E. Thomas, June 15, 1853 ; Silas Stedman, March 19, 1861 ; James T. Bridgeman, January 18, 1865; William H. Conner, May 23, 1867; James T. Bridgeman, June 10, 1867; E. A. Little, November 12, 1867; James T. Bridgeman, March 23, 1869; Charles A. Spencer, April 6, 1880; Joseph Osthelder, January 13, 1886; B. F. Heald, January 16, 1890; George B. Ogle, May 16, 1894; B. H. Sanford, August 8, 1898; George A. Robbins, April 24, 1908. The German Bank of Sheboygan Falls was established in 1874 as a branch of the German Bank of Sheboygan. Some years later it became an independent institution. It is capitalized at $25,000, has a surplus of $25,000, and its last statement showed deposits of $360,000. The officers are: Abner O. Heald, president; O. D. Ballschmider, cashier. The State Bank was organized May 18, 1910, with a capital stock of $20,000. It is practically a continuation of the former Dairyman's Bank, the first financial institution organized at the Falls. The headquarters of the bank are in the recent Dairyman's Bank building, which has recently been remodeled. The officers of the State Bank are: President, Henry Hillemann ; vice president, R. P. Dassow ; cashier, E. G. Roehl ; assistant cashier, M. T. Hillemann. In 1855 George H. Brickner removed from Tiffin, Ohio, to Cascade, where he opened a general store but later he operated an ashery and flour mill and a farm. He continued in business at that place until 1868, when he bought Mr. Prentiss' lialf interest in the Sheboygan Falls Woolen Mills and formed a partnership with B. F. Heald, under the firm name of Brickner & Heald. That connection was continued four years, when Mr. Brickner bought Mr. Heald's interest and became sole owner of the property. He greatly extended the plant^nd purchased the Riverside Mills, conducting the business alone until 1887, when he converted it into a corporation known as the Brickner Woolen Mills Company, with a capital stock of $100,000. George H. Brickner was chosen president, and his son, William Day Brickner, treasurer. The present officers are: W. C. Brickner, president; Georgiana Hawkins, vice president; F. A. Ogle, secretary. The plant is situated on the west bank of the Sheboygan river and adjacent to the railroad bridge. The factory is composed of fine brick buildings and is known to the trade as a six set mill, operated by water power, owned by the company. It employs a large number of people and consumes large quantities of wool. Shawls, dress goods and cashmere's are manufactured. Sheboygan Falls is quite a stirring little manufacturing city. But a short distance from the corporation line, on the "Town line" road, is the Richardson Brothers' chair factory. The Lake Shore Canning Company employs many people in the season. There are the White Wagon Works and others; Falls Brick & Tile Company; the H. Anderson and the Elmer McKinnon cheese factories; Kerskamp Brothers' foundry; Otto Armbruster andFalls Machine Companies ; Falls Stanchion Company ; lime kiln and quarry of the Sheboygan Construction Company. At Sheboygan, on February 11, 1838, the first Baptist church in the state of Wisconsin was organized, with the following six charter members: William Trowbridge, A. G. Dye, William S. Trowbridge, Dorothy Trowbridge, Mary Dye and Sarah W. Cole. William S. Trowbridge was chosen clerk and William Trowbridge, deacon. The first meetings of the society were held in private houses and schoolhouses. "Deacon" Trowbridge acting as the pastor. At the time of the business depression in 1837, the few members of this church were scattered, but those remaining still held meetings at their homes. About 1839 the church was moved to Sheboygan Falls, and in 1840 Albert Rounesville and his wife Lupy, and Elvira O'Cain, afterward the wife of William S. Trowbridge, were admitted to the church by letter. Elder Hitchcock began to preach in 1845 and in that year it was voted by the members that the church be called the Sheboygan Falls Baptist church, and at the same time Sheboygan Falls was designated as the place of meeting. Revs. Hitchcock, 1845-47; Abner Lull, 1847-57; E. W. Wilcox, 1857-58; O. Taylor, 1858-60; H. F. Knowles, 1860-62; Abner Lull, 1860-68; F. Todd, 1868-71 ; J. Jackson, 1871 ; William Roney, 1871-73; P. Work, 1873-77; H. H. Beach, 1877-81 ; John Churchill, 1881-85 ; E. E. Dresser, 1885-91 ; D. C. Smith, 1891-94; S. Wiltshire, 1894-95; C. T. Everett, 1895-98; E. E. Dresser, 1898-1905; F. F. Parsons, 1905 to the present. The first Catholic service in Sheboygan Falls was held by a priest from Sheboygan, in a private home. These visits were kept up at regular intervals for a time and were finally abolished, after which the Catholics of Sheboygan Falls were obliged to go to Sheboygan to attend service. Eventually a few made an effort to organize a society in this place and it is largely due to the efforts of G. H. Brickner that such a plan was consummated, and a church built. A frame building 68x34 feet was erected, the basement of which is used for social gatherings. The structure was completed in December, 1896, and on January 1 the first service was held by Rev. D. F. Thill, of Sheboygan. On the 24th of May, 1897, the church was dedicatedby the Most Rev. Archbishop Katzer and on the 2d of July, Rev. C. F. Keyser, at that time assistant pastor of Holy Name church in Sheboygan, became the resident pastor. A pipe organ has been installed, the gift of Mr. Brickner. The membership is increasing in numbers and the church is in a prosperous condition. The present pastor is Rev. B. Salbreiter. The records of this church are very meager. However, it is known that the first services by Episcopalians were held in "Free Hall," on the first Sunday after Easter in the spring of 1864, presided over by the rector of Grace Episcopal church of Sheboygan. 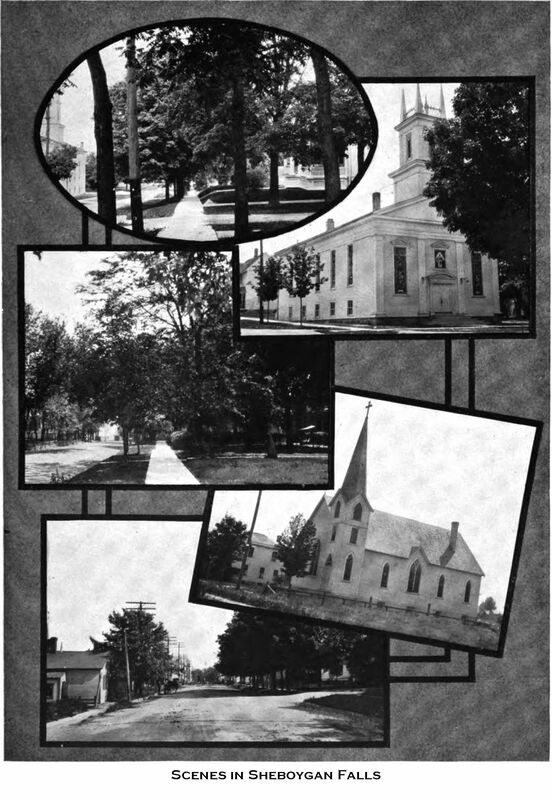 Later services were held in the schoolhouse and then at Chamberlain's Hall. The cornerstone of the church building was laid by Bishop Kemper, June 8, 1869, and on January 16, 1870, the church was dedicated. For some years this was a mission station, being supplied in their order by Revs. J. G. McMurphy, Upjohn and R. W. Blow. The latter held services here for several years, and later the rector from Plymouth came occasionally. The present rector, Rev. N. D. Stanley, has been in charge since 1885. The property of this parish, consisting of the frame church building, pipe organ, parsonage and two other houses, is valued at $7,000. The early records of this church have been destroyed, but it is known that its organization took place in 1846, with a membership of about 30. Rev. L. S. Prescott was the first pastor. The first church building was erected in 1852. In 1910 the church was remodeled. New stained glass were placed in the windows and a steam heating plant, electric lights and a pipe organ installed. With the parsonage the church property is valued at $11,500. The present membership is 147; Sabbath school, 150. The following pastors have succeeded L. S. Prescott: D. Lewis; M. Himebaugh, up to 1851; T. C. Golden, 1851-53; Rev. Barnes, 1853-55; M. Bennett, 1855-56; Thomas Wilcox, 1856-57; Joseph W. Anderson, 1857-58; T. O. Hollester, 1858-59; H. B. Crandel, 1859-60; H. Requa, 1860-61 ; A. C. Huntley, 1861-62; S. W. Ford, 1862-64; J. Revell, 1864-65; J. C. Robbins, 1865-67; A. A. Reed, 1867-70; C. E. Carpenter, 1870-72; I. S. Eldridge, 1872-73; C. R. Pattee, 1873-74; B. M. Fulmer, 1874-76; I. F. Boynton, 1876-78; G. F. Reynolds, 1878-81; C. D. Pillsbury, 1881-82; D. V. Teed, part of 1882; G. H. Trever, 1883-84; E. A. Wanless, 1884-85; C. Bristol, part of year 1885; W. Simmons, part of year 1886; William M. Trever, 1886-88; J. P. Beadle, 1888-89; G. W. Pratt, 1889-91 ; Andrew Porter, 1891-94; Thomas James, 1894-97; J. V. Trenery, 1897-1900; T. W. Sprouls, 1900-02; Charles Wentworth, 1902-05; D. H. Carmichael, 1905-06; Robert S. Ingraham, 1906-1911, and the present pastor, who took charge April 1, 1911. The people of this church effected an organization about sixty years ago. There is now a membership of 130, and in the Sabbath school there are about 60. Connected with the church are the Christian Endeavor, Dorcas and Foreign Missionary Societies. The church building is a modest frame. The society also owns its parsonage. Rev. J. H. Tetema was the last regular pastor, who left in 191 1. Since then services have been held every two or three weeks by visiting pastors. Revs. Frederick Ottamaim, J. Hoffmann, J. M. Hieber, George Wildermuth. The latter took charge of the congregation in 1894 and is still the pastor. FRATERNAL ORDERS - JAIRUS RICHARDSON POST, NO. 12, G. A. R.
This organization of veterans of the Civil war was organized July 10, 1883. The charter members were: J. M. Hunter, T. C. Hawkins, A. T. Dean, George Spratt, H. E. Wood, J. C. O'Brien, John Arnold, W. P. Bryant, James Sims, Joseph Osthelder. As the years have gone by the ranks have become thinner and thinner until there is scarcely a corporal's guard to appear in answer to roll call at the meetings, which are held twice a month. ST. JOHN'S LODGE, NO. 24, A. F. & A. M.
Organized September 6, 1849, with a membership of 10. The first officers were: Harrison C. Hobart, W. M.; L. W. Davis, S. W. ; L. B. Brainard, J. W.; V. Young, S.; William Trowbridge, T.; G. H. Smith, S. D. ; S. Roberts, J. D. ; Thomas I. Graham, tiler. The present membership is 80, and oflScials are : W. M., H. P. Giddings ; S. W., John E. Newhouse; J. W., P. F. Schlichting; S. D., William S. Lumsden; J. D., Dr. A. R. Lindow ; Treas., H. E. Boldt ; Sec, E. P. Heidenreiter ; stewards, August' M. Bertram, Clair W. Bryant. GUTTENBERG LODGE NO. 285, I. O. O. F.
This lodge was organized June 5> 1880, with the following charter members: A. F. Meyer, D. Hemschemeyer, C. Wedepohl, Joseph Osthelder, Sr., Frank Krannich, Charles S. Weisse, August Schweitzer. The officers are: N. G. Balkins, N. G.; M. Kutzback, V. G.; Dr. R. M. Nichols, Sec. ; William Kubel, Rec. Sec. ; August Michael, Treas. The membership is now about twenty. Guttenberg Lodge is probably an offshoot, or the reorganization of Fidelity Lodge, No. 34, which was organized March 7, 1849, and reorganized in 1871. FALLS CAMP, NO. 1073, M. W. A. Falls Camp was organized in 1889 and has a membership of 101. Its venerable counsel is George Kalmerton; vice counsel, James De Smith; clerk, C. C. Meyer. Meetings are held every third Monday of the month. RIVERSIDE CAMP, NO. 764, R. N. A. This lodge was instituted October 5, 1897, with 22 members. The present membership numbers 47. The first Officials were: Oracle, Mrs. Ella Robbins; vice oracle, Mrs. Lizzie De Smith; recorder, Mrs. Ida Barragar; receiver, Mrs. May Showers; marshal, Mrs, Minnie Boldt. The present officials are: Oracle, Mrs. Mary Constance ; vice oracle, Mrs. Edith Chase; past oracle, Mrs. Mary Riebel; recorder, Mrs. Lizzie De Smith; receiver, Mrs. Ida Barragar; chancellor, Mrs. Alice Wilson; marshal, Mrs. Sarah Melendy. SHEBOYGAN FALLS ASSEMBLY, NO. 80, E. F. U. The Equitable Fraternal Union was organized in 1899, with twenty charter members. There are now 220 members. The officials of this organization are: President, M. J. Deeley; vice president, T. W. Eichhorn ; secretary, Joseph Osthelder ; treasurer, George A. Robbins ; adviser, Mrs. E. C. Gloff ; warden, E. C. Gloff ; sentry, Qinton E. Brown. The Beavers lodge was organized September 9, 1909, with 85 charter members. The present membership is no. The charter officials were: C. F. Heald, commander; C. J. Heule, vice commander; W. C. Bryant, secretary;Otis McKinnon, treasurer. The present officials are: C. J. Heule, conmiander; Herman Reichert, vice commander; E. H. Granger, secretary; W. L. Piper, treasurer. The Beaver Queens of Sheboygan Falls, No. 599, an auxilliary lodge, was organized in May, 1910. There were 27 charter members, and the membership now numbers 42. The first officials were : Mrs. A. E. Cox, most worthy queen ; Mrs. S. Byrum, worthy duchess; Mrs. Alice Osthelder, worthy princess; Mrs. E. Holden, past worthy duchess; Mrs. E. Holden, worthy princess; Mrs. A. E. Cox, past Miss May De Groff, queen of charity ; Mrs. Hilda Granger, queen of faith; Mrs. E. Themming, queen of humanity; Mrs. Emily Fricke, queen of the home; Bessie Holden, queen Victoria; Amy Scheirk, queen Louise; Mrs. Louisa Amdt, queen Isabella; Mrs. H. Hansen, queen of love. Present officers: Mrs. Sylva Byrum, most worthy queen; Mrs. Louisa Amdt, worthy duchess; Mrs. E. Holden. worthy princess; Mrs. A. E. Cox, past worthy queen ; Mrs. Hannah Granger, secretary; Mrs. Jane Pf eif er, treasurer; Mrs. Rose Patrick, queen of charity; Mrs. R. Lintner, queen of faith; Mrs. Fannie Cox, queen of humanity; Miss Edith Piper, queen of the home; Bessie Holden, queen Louise; Annie Scheirk, queen Victoria; Mrs. H. Hansen, queen Isabella; Mrs. Myrtle Ramaker, queen of love. An old unpainted wooden building, bearing evidence of having withstood the attacks of the storms of many years, stands in the east part of the village of Sheboygan Falls. 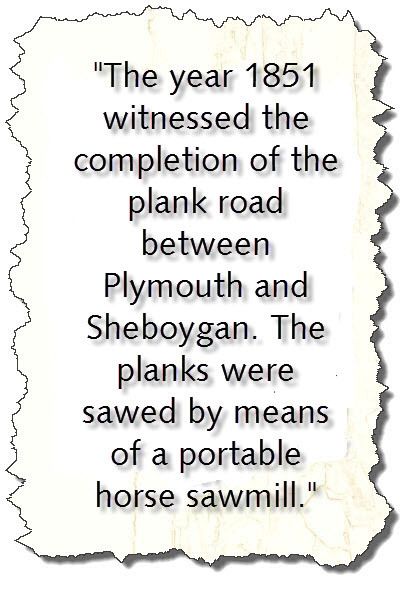 This landmark of historic interest, erected about 1846, of the very best of the original pine timber grown in the vicinity, and probably sawed at the old mill then a few rods distant, is supposed to be the first school building erected in Sheboygan county. 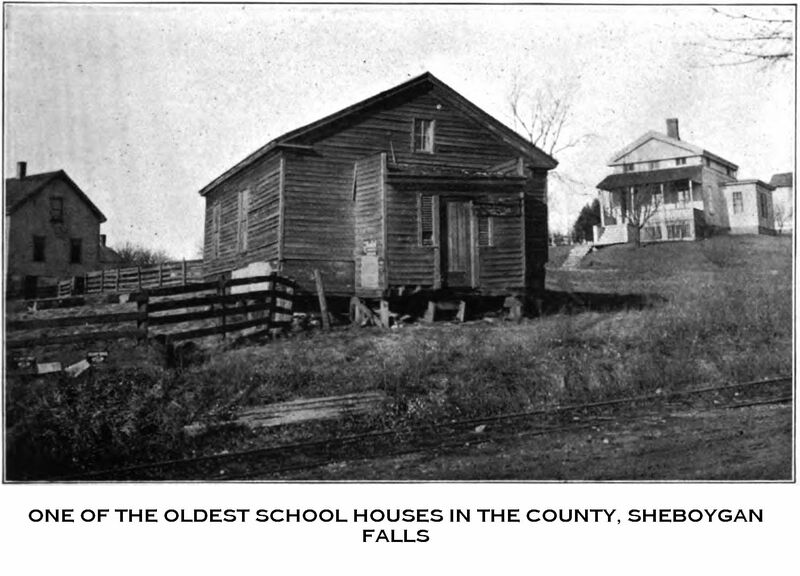 In early days Sheboygan Falls was the metropolis of the county, at one time leading Sheboygan in population, and it was about this period that the old school house was built. In this modest structure many of the younger people of the early settlers began and finished their school days, and doubtless many are the pleasant memories clustering around the old building and treasured by the few remaining teachers and pupils of the long ago. A number of the students and teachers who frequented this building have become prominent in the county, and some even attained national ftoie. Among the latter was Hon. Horace Rublee, who was Ambassador to Switzerland at one time, but is better known in Wisconsin as the editor of the Milwaukee Sentinel, a position he filled with ability for many years. He was at one time a pupil of Samuel Rounsville of Sheboygan, and about 1851 he was a teacher in the old building that is the subject of this sketch.